This site was the location of Sanford School in the village of Sanford, in the Rural Municipality of Macdonald. It originated with Ashland School No. 86, established formally in March 1880. For a time, classes were held in a granary on the farm of Walter Burns, under teacher G. M. Atkinson. The school board soon purchased half an acre of land at SE30-8-1E from board chairman John W. Parker, for the sum of $1. A building measuring 18 feet by 24 feet was erected, with two windows on each of three sides. It was used until 1898 when a more modern school was built nearby. This second Ashland School was used for 16 years. In March 1913, Ashland School was consolidated with Prairie Centre School No. 1349 to become Sanford Consolidated School No. 86. Needing a larger building, the school board borrowed $10,000 to construct a new building on five acres of land in the village of Sanford, purchased for $125 from the Parker estate. Designed by Winnipeg architect E. D. Tuttle, the two-storey frame structure featured an auditorium with a stage for school and community functions. By the fall of 1915, it had three teachers, increasing to four teachers in 1926 when the school began offering instruction in grade 12. When grades 9-12 were transferred to Sanford Collegiate in early 1962, the school subsequently became an elementary school. 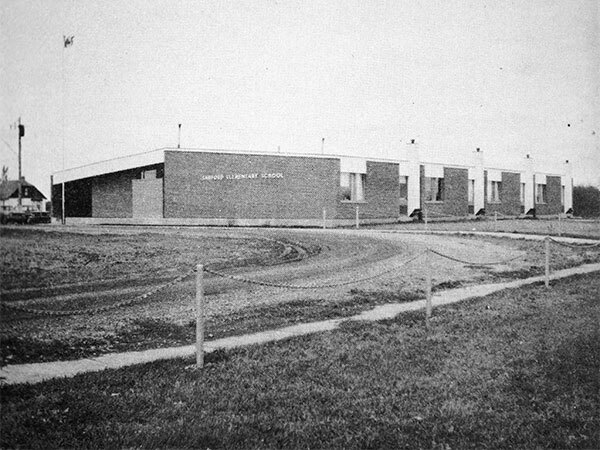 In 1964, a new four-classroom school was built and, later that year, the old school was demolished. The school district was dissolved in 1969 and the Morris-Macdonald School Division No. 19 was formed. Additions to the building were made in 1974 and, around this time, the school was renamed posthumously in honour of James Anthony Cuddy. In August 1981, the former school bell was mounted in front of the new school, along with plaques commemorating the school and other rural schools in the vicinity: Donore School No. 118 at NW10-8-1E (1881-1952), Ferndale School No. 498 at NE3-9-1W (1881-1960), and Golden Valley School No. 1438 at SE30-8-1W (1908-1955). The bell had been purchased in April 1915 with the proceeds of a community dance. Among the teachers of Ashland School was J. E. Hurl (1906). Among the other teachers of Sanford School was W. A. Toews. Source: Archives of Manitoba, Manitoba Local Government Boundaries Commission, File 7a Sanford. “Tenders for Sanford School,” Manitoba Free Press, 4 June 1914, page 2. 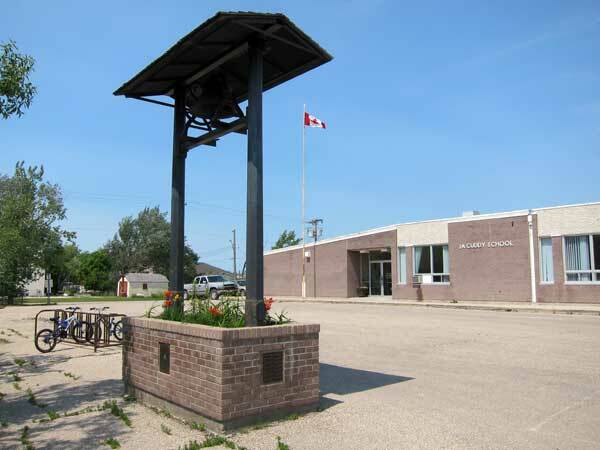 Marriage registrations [Vietta Helen Clement], Manitoba Vital Statistics. Sanford-Ferndale, 1871-1987 by Sanford-Ferndale History Committee, 1989. Obituary [Ada Miriam (Barclay) Hall], Winnipeg Free Press, 5 June 1997, page D6. Manitoba School Records Collection, Sanford School District No. 86 Daily Registers, GR0638, Archives of Manitoba. Manitoba Local Government Boundaries Commission, Schools in Manitoba - Volume 2, Sanford Consolidated School - File 7a, March 1968, Archives of Manitoba. We thank Derryl Hall for providing additional information used here.